Gavin Guile sleepily eyed the papers that slid under his door and wondered what Karris was punishing him for this time. His rooms occupied half of the top floor of the Chromeria, but the panoramic windows were blackened so that if he slept at all, he could sleep in. The seal on the letter pulsed so gently Gavin couldn’t tell what color had been drafted into it. He propped himself up in bed so he could get a better look and dilated his pupils to gather as much light as possible. On every side, the floor-to-ceiling blackened windows dropped into the floor, bathing the room in full-spectrum light as the morning sun was revealed, climbing the horizon over the dual islands. With his eyes dilated so far, magic flooded Gavin. It was too much to hold. Light exploded from him in every direction, passing through him in successive waves from superviolet down. The sub-red was last, rushing through his skin like a wave of flame. Gavin jumped out of bed, sweating instantly. But with all the windows open, cold summer morning winds blasted through his chambers, chilling him. He yelped, hopping back into the bed. His yelp must have been loud enough for Karris to hear it and know that her rude awakening had been successful, because he heard her unmistakable laugh. She wasn’t a superviolet, so she must have had a friend help her with her little prank. A quick shot of superviolet luxin at the room’s controls threw the windows closed and set the filters to half. Gavin extended a hand to blast his door open, then stopped. He wasn’t going to give Karris the satisfaction. Karris’s assignment to be the White’s fetch-and-carry girl had ostensibly been intended to teach her humility and gravitas. So far that much had been a spectacular failure, though the White always played a deeper game. Still, Gavin couldn’t help grinning as he rose and swept the folded papers Karris had tucked under the door to his hand. He walked to his door. On a small service table just outside, he found his breakfast on a platter. It was the same every morning: two squat bricks of bread and a wedge of cheese. The bread was made of wheat, barley, beans, lentils, millet, and spelt, unleavened. A man could live on that bread. In fact, a man was living on that bread. Just not Gavin. Indeed, the sight of it made Gavin’s stomach turn. He could order a different breakfast, of course, but he never did. He brought it inside, setting the papers on the table next to the bread. One was odd, a plain note didn’t look like the White’s personal stationery, nor any official hard white stationery the Chromeria used. He turned it over. The Chromeria’s message office had marked as being received from “ST, Rekton”: Satrapy of Tyrea, town of Rekton. It sounded familiar, maybe one of those towns near Sundered Rock? But then, there had once been so many towns there. Probably someone begging an audience, though those were supposed to be screened out and dealt with separately. Still, first things first. He tore open each loaf, checking that nothing had been concealed inside it, and broke open each wedge of cheese. Satisfied, he turned toward the morning sun. A pale, granite blue swirled in his eyes like smoke, passing from Gavin’s multicolored irises to the whites, and then disappearing deeper into his body. Wisps of that pale blue brushed the skin around his temples, then in his neck, before coming to rest in his right hand. Gavin drafted only enough magic to fill the fingers of his right hand. He held his hand up against the pale, granite blue sky of a painting he kept on the wall as his reference. Then he turned his hand over. There wasn’t much pigment in the backs of his tan fingers, but there was almost none in the front, and it was vital to get this exactly right, to adjust even for the reds that shone through his skin from his capillaries. He did it perfectly, of course. He’d been doing this for five thousand mornings now. Almost sixteen years. A long time for a man only thirty-three years old. He drafted the blue into the bread, dyeing it the same color, same intensity, same saturation throughout. Then the cheese. Gavin picked up the note. Suddenly his throat clamped down, and his chest felt like his heart was seizing up, no matter that the chirugeons said. Just relax, they said. Young and strong as a warhorse, they said. They didn’t say grow a pair. You’ve got lots of friends, your enemies fear you, and you have no rivals. You’re the Prism. What are you afraid of? No one had talked to him that way in years. Sometimes he wished they would. Orholam, the note hadn’t even been sealed. Gavin walked out onto his glass balcony, subconsciously checking his drafting as he did every morning. He stared at his hand, splitting sunlight into its component colors as only he could do, filling each finger in turn with a color, from below the visible spectrum to above it: sub-red, red, orange, yellow, green, blue, superviolet. Had he felt a hitch there when he drafted blue? He double-checked it, glancing briefly toward the sun. No, it was still easy to split light, still flawless. He released the luxin, each color sliding out and dissipating like smoke from beneath his fingernails, releasing the familiar bouquet of resinous scents. He turned his face to the sun, its warmth like a mother’s caress. Gavin opened his eyes and sucked in a warm, soothing red. In and out, in time with his labored breaths, willing them to slow. Then he let the red go, and took in a deep icy blue. It felt like it was freezing his eyes. As ever, the blue brought clarity, peace, order. But not a plan, not with so little information. He let go of the colors. He was still fine. He still had at least five years left. Plenty of time. Five years, five great purposes. Well, maybe not five great purposes. Still, of his predecessors in the last four hundred years, aside from those who’d been assassinated or died of other causes, the rest had served for seven, fourteen, or twenty-one years after becoming Prism. Gavin had made it past fourteen. So, plenty of time. No reason to think he’d be the exception. Not many reasons, anyway. He was still holding the White’s note. Cracking her white seal—the old crone sealed everything, though she shared the other half of this floor and Karris hand-delivered her messages. But everything had to be in its proper place, properly done. There was no mistaking that she’d risen from Blue. Looking beyond the Chromeria’s buildings and the city, Gavin studied the merchant ships in the bay cupped in the lee of Big Jasper Island. A ragged-looking Atashian sloop small enough that it was maneuvering in to dock directly at a pier. Greeting new students. Unbelievable. It wasn’t that he was too good to greet new students—well, actually, it was that. He, the White, and the Spectrum were supposed to balance each other. But though the Spectrum feared him the most, the reality was that the crone got her way more often than Gavin and the seven Colors combined. This morning, she had to be wanting to experiment on him again, and if he wanted to avoid something more onerous like teaching he’d better get to the top of the tower. Gavin drafted his red hair into a tight ponytail, and dressed in the clothes his room slave had laid out for him: an ivory shirt and an well-cut pair of black wool pants with an oversize gem-studded belt, boots with silverwork and a black cloak with harsh old Ilytian runic designs embroidered in silver thread. The Prism belonged to all the satrapies, so Gavin did his best to honor the traditions of every land—even one that was mainly pirates and heretics. He hesitated a moment, then pulled open a drawer and drew out his brace of Ilytian pistols. They were, typically for Ilytian work, the most advanced design Gavin had ever seen. The firing mechanism was far more reliable than a wheellock—they were calling it a flintlock. Each pistol had a long blade beneath the barrel, and even a belt-flange so that when he tucked them into his belt behind his back, they were held securely and at an angle so he didn’t skewer himself when he sat. The Ilytians thought of everything. And, of course, the pistols made the White’s Blackguards nervous. Gavin grinned. When he turned for the door and saw the painting again, his grin dropped. Gavin walked back to the table with the blue bread and blue cheese. Grabbing one use-smoothened edge of the painting, he pulled. It swung open silently, revealing a narrow chute. Nothing menacing about the chute. Too small for a man to climb up, even if he overcame everything else. It might have been a laundry chute. Yet to Gavin, it looked like the mouth of hell, the evernight itself opening wide for him. He tossed one of the bricks of bread and the cheese into it, then waited. There was a thunk as the bread hit the first lock, a small hiss as it opened, then closed, then a smaller thunk as it hit the next lock, and a few moments later, one last thunk. Each of the locks was still working. Everything was normal. Safe. There had been mistakes over the years, but no one had to die this time. No need for paranoia. He nearly snarled as he slammed the painting closed. Continue to Chapter Three below! 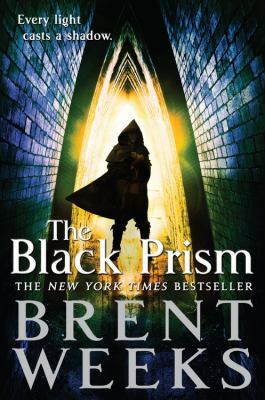 Brent Weeks studied at Hillsdale College, before brief stints walking the earth like Caine from Kung-Fu, also tending bar, and corrupting the youth. (Not at the same time.) He started writing on napkins and, eventually, someone paid him for it. Brent doesn’t own cats or wear a ponytail.